Humboldt Fog is Cypress Grove's "signature cheese," with a ribbon of edible vegetable ash along its center and a coating of ash under its exterior that gives it a distinctive, cake-like appearance. Cypress Grove is often in the spotlight at the Specialty Food Association's Sofi Awards. Truffle Tremor won the Gold in the Cheese Category, and Humboldt Fog was a finalist in the Classic Category. Previous awards from the Specialty Food Association include Outstanding Product Line in 2006 and 2007. And Cypress Grove's "Ewe F-O" was a finalist in the SFA's New Product Category in 2006. The U.S. Small Business Administration (SBA) in San Francisco has announced that Mary Keehn, owner of Cypress Grove, is the winner of its 2009 Small Business Person of the Year award. The SBA award's criteria are not only for developing an outstanding business; a business must also help make a contribution to the community. 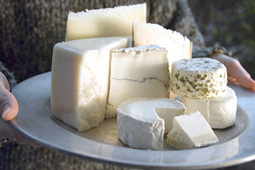 Two Cypress Grove cheeses took top honors at the 2004 World Cheeses Awards in London: Humboldt Fog, their signature cheese, won Gold and Mt McKinley, their aged shepherd’s style cheese, captured Silver. Mary Keehn acquired her first goat in a rather unusual fashion. “I was interested in having healthy milk for our family.” Mary explains. “Our neighbors had a cow dairy and also had some goats to eat the brush on their farm, so I asked if I could buy one of their goats. They told me, ‘If you can catch one, you can have it.’ And I did.” When asked about her tactics for this capture, Mary revealed that goats can’t resist grain, so she used that to lure the goat close enough to catch. Evidence of the fact that Mary is always coming up with something new is Cypress Grove’s new partner – "Bella de Balle,” pictured on the Midnight Moon label. 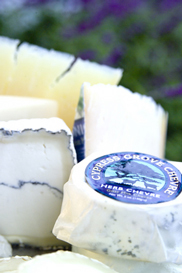 The Cypress Grove Cream Line and “Bella” will be creating a new line of cheeses that will, in time, include specialty cow and/or mixed milk cheeses. An exciting development for Cypress Grove has been the move to a new home in Arcata. “This 18-acre property was the last available zoned agricultural parcel in the city of Arcata, and cow dairies have been located here since the late 1800s. We were already committed to buying it when we discovered in an old newspaper that in 1915 there was a Cypress Grove Dairy right here!” Mary has preserved the old cow barn and the little building where the milk was bottled. A friend brought her an old bottle from the Arcata Creamline Dairy, which was once on the property. The slogan on the back of the bottle reads: “You can whip our cream, but you can’t beat our milk.” Cypress Grove Cheese would make those old dairymen proud. "We realize that quality must be evident in more than the cheese," says Keehn. "We have to have excellent milk, and that means healthy goats and family farms. By contributing to our employees and community, we make it clear that we are all motivated by the same commitment to quality of life."